John Grishams first work of nonfiction, an exploration of small town justice gone terribly awry, is his most extraordinary legal thriller yet. In the major league draft of 1971, the first player chosen from the State of Oklahoma was Ron Williamson. When he signed with the Oakland As, he said goodbye to his hometown of Ada and left to pursue his dreams of big league glory. Six years later he was back, his dreams broken by a bad arm and bad habitsdrinking, drugs, and women. He began to show signs of mental illness. Unable to keep a job, he moved in with his mother and slept twenty hours a day on her sofa. With no physical evidence, the prosecutions case was built on junk science and the testimony of jailhouse snitches and convicts. Dennis Fritz was found guilty and given a life sentence. Ron Williamson was sent to death row. The rolling hills of southeast Oklahoma stretch from Norman across to Arkansas and show little evidence of the vast deposits of crude oil that were once beneath them. Some old rigs dot the countryside; the active ones churn on, pumping out a few gallons with each slow turn and prompting a passerby to ask if the effort is really worth it. Many have simply given up, and sit motionless amid the fields as corroding reminders of the glory days of gushers and wildcatters and instant fortunes. There are rigs scattered through the farmland around Ada, an old oil town of sixteen thousand with a college and a county courthouse. The rigs are idle, thoughthe oil is gone. Money is now made in Ada by the hour in factories and feed mills and on pecan farms. Downtown Ada is a busy place. There are no empty or boarded-up buildings on Main Street. The merchants survive, though much of their business has moved to the edge of town. The cafés are crowded at lunch. 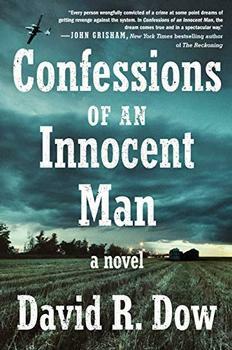 Judged against Grisham's fictional works, The Innocent Man compares well, his prose style is tight and fast-paced, the extremely large cast of characters are sketched succinctly and courtroom legalities are explained in a style simple enough for the layman to follow, and we're left in little doubt about who are the good guys and who are the bad .... However, Grisham's black and white approach to the real world which, unlike fiction, is always drawn in shades of gray, is the weakness of The Innocent Man when judged as a work of nonfiction. (Reviewed by BookBrowse Review Team). [A]fter reading The Innocent Man, you do wish Grisham had used some of his novelist’s technique to marshal the facts at his disposal. Instead, he never gets the plot up to a decent boil. The one-sidedness of The Innocent Man is a shame, for two reasons. First, because it feeds the popular perception -- nurtured by Hollywood and the news media -- that death rows are teeming with wrongfully convicted men who just await DNA testing to set them free. Second, by skewing his tale, Mr. Grisham missed an opportunity to tell a well-rounded and perhaps more interesting story than the one he delivers. The Innocent Man is less spectacular than sturdy. It is a reminder not only of how propulsively Mr. Grisham’s fiction is constructed but of how difficult it is to make messy reality behave in clear, streamlined fashion. The Innocent Man is a useful companion to Ultimate Punishment (2003), the argument against the death penalty by that other lawyer who writes skillful fiction, Scott Turow. Like Turow, Grisham realizes that the most powerful argument against the death penalty is that it kills the innocent as well as the guilty, a case that he makes simply by telling Williamson and Fritz's story. His prose here isn't as good as it is in his novels…but his reasoning is sound and his passion is contagious. Compared with other works in its genre, The Innocent Man is less spectacular than sturdy. It is a reminder not only of how propulsively Mr. Grisham's fiction is constructed but of how difficult it is to make messy reality behave in clear, streamlined fashion. Frankly, Grisham overdoes it a little. He states and re-states each malfeasance, and writes in exhausting detail about Williamson's untreated mental illness. But when Grisham gets into what happened to Williamson and company during their prison stay, The Innocent Man finds its purpose. In his first foray into nonfiction, novelist John Grisham has crafted a legal thriller every bit as suspenseful and fast-paced as his best - selling fiction. A gritty, harrowing true-crime story. Grisham is at his succinct, and often sardonic, best. Grisham has written both an American tragedy and his strongest legal thriller yet, all the more gripping because it happens to be true. Grisham lets this gripping story tell itself. Without directly attacking capital punishment, he demonstrates the gross fallibilities of the system, exposing here not merely a 'miscarriage of justice' but its utter collapse. Contrary to the opinion of many critics, Grisham is a great storyteller and a fine, no-nonsense writer. He has a well-honed attention to detail. He doesn't degenerate into cliches and he has a natural sense of dramatic structure that ensures the book has a compelling forward momentum.